For the last few decades, Bosnia and Herzegovina is waiting to see a significant progress of the construction works on the Corridor Vc route, but the completion of this project seems to lie in the very distant future. Politicians, construction companies and investors give different information about the possible date of the Corridor’s inauguration. The truth is that until now less than half of this important highway that would connect the country with the EU has been completed. Federation BiH companies are engaged on this project and trying to complete the project, but all deadlines have been extended several times on every part of the Corridor. Republika Srpska still did not even start to build the 46 kilometers of Corridor in its territory. They are more engaged with their own highway network which will link Novi Grad on the West with Bijeljina on the East of this entity. As money is always the problem, the European Bank for Reconstruction and Development decided to approve the new, €180 million sovereign loan to BiH for the construction of three new sections of Corridor Vc in the Federation BiH, with a total length of approximately 15.8 km. The contract of this loan was signed in Sarajevo on Wednesday. “The people of Bosnia and Herzegovina will make further step towards EU markets with the construction of new sections of Corridor Vc, the country’s main infrastructure project, which will strengthen its regional and international integration”, EBRD says in a press release. Under the agreement, the first tranche will be worth up to €120 million to co-finance with the European Investment Bank (EIB) the construction of a motorway section from Poprikusa to Nemila, as well as to finance the construction of the Tunnel Ivan. The second tranche, up to €60 million is supposed to finance the construction of a motorway section from the Mostar South Interchange to Tunnel Kvanj. “The European Union is the EBRD’s strategic partner in the development of the Corridor Vc. The loan is expected to be co-financed by an investment grant in the amount of €11.8 million from the European Union, through the Western Balkans Investment Framework (WBIF) which is expected to be approved in December 2018”, EBRD stressed. 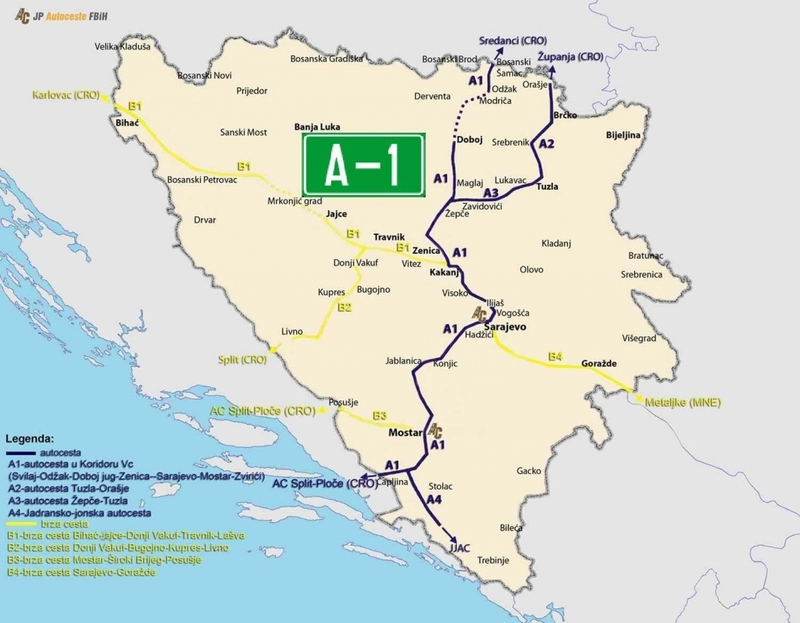 The head of the EU Delegation to BiH, Lars-Gunnar Wigemark, said at the ceremony that since the launch of the Connectivity Agenda in 2015, the European Union has been pledging grants to make the construction of Corridor Vc motorway project possible, in order to connect BiH with its neighbours and other European countries.